Slower growth in China could threaten billions of dollars of mining projects, hitting the region’s major coal exporters, including Indonesia and Australia. Yet despite the gloom, miners are hopeful of better times ahead, not least due to the U.S. Federal Reserve. After a year of job cuts, mine closures and cutbacks, the coal industry was hit by a report from Oxford University’s Smith School of Enterprise and the Environment that predicted some $50 billion of planned mines in Australia were at risk of being “stranded” due to reduced demand. Noting that China now accounts for half the world’s coal consumption, the report said China was becoming the industry’s price setter, with its recent surge in demand sparking renewed interest in areas previously considered uneconomic. However, all this could change with lower economic growth, a structural shift from investment to consumption and measures to curb pollution. “Demand below expectations, and lower coal prices as a result, would increase the risk that coalmines, reserves and coal-related infrastructure could become mothballed or abandoned,” the report warned. The report said new coal projects planned for Australia with a total potential capacity of 550 million tons a year would more than double current output, adding to increasing supply from Indonesia and elsewhere. The British university’s study came on the back of a forecast by the International Energy Agency (IEA) that China’s policies to curb its coal dependency would hit demand. 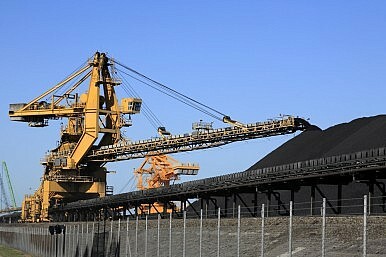 It cut its projection to 2.3 percent annual growth in coal demand through to 2018, compared to the previous 2.6 percent. “While China will account for nearly 60 percent of new global demand over the next five years, government efforts to encourage energy efficiency and diversify electricity generation will dent that growth, slowing the global increase in demand,” the IEA said. Nevertheless, the agency said coal demand in the rest of Asia would remain buoyant over the next five years, driven by growth from India and Southeast Asia. India is expected to rival China as the top importer, while coal use in Japan and South Korea would also continue to expand. In better news for miners, Australia’s Bureau of Resources and Energy Economics (BREE) has raised its forecasts for exports of iron ore and metallurgical coal for fiscal 2014, projecting a 23 percent rise in iron ore exports and a 6 percent increase for coal. The nation is expected to generate A$205 billion in resource and energy exports in fiscal 2014, helped by higher export volumes and a lower exchange rate against the U.S. dollar. Mining industry veteran Tony Fawdon, executive chairman of explorer Diatreme Resources, said the Australian industry would benefit from a weaker currency. “The big item for 2014 for Australia will be the lower dollar. A lot of companies are struggling at the moment at current commodity prices, but a lower dollar will make a huge difference to the profitability of their operations,” he told The Diplomat. Fawdon said he expected a pickup towards the latter half of 2014 due to the upturn in the United States as well as Europe, while Chinese GDP growth would continue at around 7 to 8 percent. “I think it will be easier to raise capital next year. The realisation is that we’ve come off the bottom and are already starting on our way up. Even if commodity prices go backwards, the lower Australian dollar will counter that. For example, at parity with the U.S. dollar the zircon price was A$1,200 a ton, but at US$0.89 it’s suddenly A$1,350 a ton,” he said. Asked his forecasts for “hot” commodities, Fawdon said he expected a few surprises in the year ahead. “The whole minerals scene is becoming much more diversified. It’s incredibly hard to find a really large copper deposit, whereas it’s not so hard to find industrial minerals which Asia and China are screaming for. I think copper will continue to move higher, while gold could surprise with a surge toward the end of the year,” he said. After falling post the global financial crisis, commodities prices could reach another peak in 2015 or 2016, according to Fawdon. “The downturns seem to last around seven to eight years and the peak around 18 months. The main help will be that China is continuing to grow and also the falling Aussie dollar, which will make mining much more attractive,” he said. Quentin Hill, managing director of Carpentaria Exploration, said he was confident that Chinese demand for resources was far from over. “I recently attended a mining conference in China and the consensus was that Chinese demand for resources such as iron ore will remain strong. The new leadership in Beijing has pledged its commitment to further urbanization, which obviously requires more steel,” he said. This looks set to be a good year for resources importers.